Which of these hotels are walkable distance from the airport? Frankly, the best hotel at LHR is the Sofitel and so it should be as a 5 * property. Yes, we have on more than one occasion come down 2 days before flying so that we can luxuriate at the property! We use it irrespective of which terminal we fly from and we also get some very good advance rates with parking by booking direct. The parking is secure and located under the hotel – warm and dry! But it’s not an IHG property, which this whole article is on about. +1. Opportunity to show off. Is that the secret hotel? It often turns up for £90ish as a secret hotel on secretescapes/priceline type sites. Usually very easy to identify from the features. 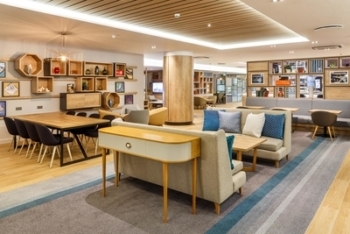 A couple of years ago priority pass offered access to the exec lounge, so it was possible to stay for £90 and then use priority pass for free breakfast or evening lite dinner in the exec lounge. They were also quite liberal with all the benefits when i had accor status on this deal. The swimming pool is great and can quite understand how someone might want to relax for a couple of days. 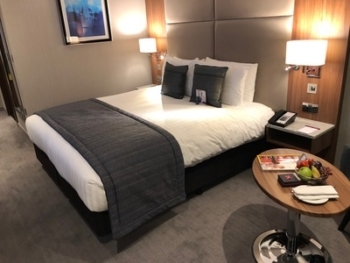 My vote is Premier Inn T4 – often £29 and connected to T4, so no need for a cab. I accept no IHG points and no status upgrades but I’d argue most people are only staying one night and I’d take the cash saving over points anytime. 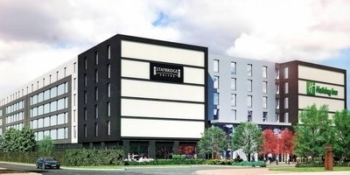 I’m afraid that I have to disagree with the friend who recommends the Holiday Inn London Heathrow T5 for its runway views: a quick Google maps check will tell you it’s in Colnbrook, a bus/taxi ride from T5 and certainly not in sight of a runway! If aircraft are coming in on 09L or departing on 27L then the heavy lifters will certainly be spectacularly low over Colnbrook (ask for a room at the front) but it’s not a “runway view”! Otherwise it’s a good Holiday Inn and the pub across the road does fine and cheap Thai food. IHG advice sought please. I have a remaining Accelerator challenge to stay at an IHG hotel for a four day stay. It must be completed before the end of the year. If I want to stay in the UK, and I’m based in London (but happy to drive up to an hour) does anyone have any advice or recommendations where I could go that’s interesting, reasonably cheap and available up to end of the year. My wife would probably prefer somewhere in the countryside but we are open to ideas. Thanks. Have a look at the Oxford properties – the HIX is almost certainly cheapest but not in a great area (unless you are a football fan) – but still only 15 mins from the centre. The Holiday Inn is a pretty nice property with a nice pool but also not central (this is my choice on business as it has free parking and is much nicer than the HIX). Then there is a Crown Plaza out in the countryside towards the Cotswolds, that night meet your wife’s requirements and certainly the nicest. It’s both a very nice country hotel and also a conference destination so might have some decent prices this year I guess. 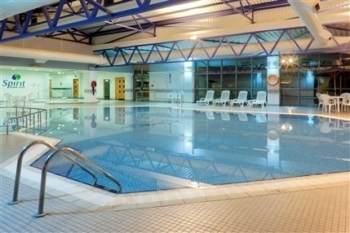 Crowne Plaza gerrards cross is a decent property. Near beaconsfield. Thanks Rob and TGLoyalty, I’ll check those out. Cotswold sounds good. Left Heathrow on Thursday night, and drove past the new Stalybridge. Did think there were more signs of habitation than previously. A grand total of about five cars parked outside! I think that you would have a peaceful night sleep here at the moment! Passed that on my way to Renaissance last night and thought the same. Then again not many people staying here either and plenty of room in the car park. Crowne Plaza Heathrow sure does need a refurbishment. Had our room stinking of cigarettes. On a points booking no free breakfast was offered to me as a Platinum Elite in August till I spoke to the manager. My two trips before were okay but once the pool was out of order. Lots of reviews show issues with parking a car there – tyres stolen, parking tickets etc. Also got caught by the fact that the Airport Hoppa didn’t go to T4 from the hotel. It was my fault but I just assumed it would serve all Heathrow terminals. Agree, wouldn’t bother with this hotel especially if you have a car, seems the security of the car park is rubbish. Lucky you got free breakfast, most CP don’t give it just for status. I’ve been given free breakfast as Spire when staying there, although usually paid stays. 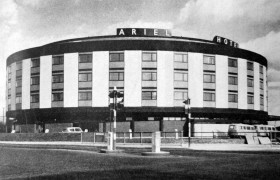 Agree, desperately in need of a refurb throughout, same could be said for Ariel too. Impressed the manage gave you free breakkie given it’s not a benefit with IHG’s programme (apart from AMB in China from next year as per other articles). Yep, zero in Auckland and Brussels for me. The former was about half the points of the Hilton though so worth the poorer property! I agree about the HIX T5. Use it quite a lot for early AM ex LHR flights. The only thing against it is its name, as it is misleading those not familiar with the airport to call a location in Slough “T5”. This site https://www.ihg.com/content/gb/en/deals/hotel-offers/parkstaygo allows you to book parking and stay at what look like good rates and you can part pay with points. I misread the instructions. Not such a good rate. The T4 CP lounge is open; I used it last Thursday night. Thanks, earlier than scheduled then. Have been given exec. Lounge access at CPs before as a Platinum member, is that usual and is it the case at the T4 CP ? Mind you, am going to hit Spire in a couple of days so should have that all 2019 (am hopefull can extend by joing Ambassador given anecdotal evidence it sometimes does). They tend to give it yes. But some properties are miserable and won’t. Honestly Hilton is the best mid and top tier status for benefits on stays. Marriot/SPG has a great top tier but not the easiest to earn. I’ve only ever seen it mentioned as a potential you might be offered, not a guarantee? Have you seen anything more recent that guarantees it? Not guaranteed of course but I have been given the choice several times now at CP properties this year, in fact I also got the free drinks vouchers and the points at one! Nice, no such luck in the couple I’ve stayed at so tend to avoid them as a brand (also tended to find them quite dated). Which hotel (IHG or other) would you recommend for a Heathrow T3 early morning departure? Just saw you are not stuck to IHG – that opens up a world of possibilities – there’s a Park Inn on Bath Road that is right by the tunnel to the terminals, but must be another 15 hotels within 5 minutes of there that would be good options, some with great runway views if that’s your thing (Sheraton is best for that I think). If you want luxury consider the Sofitel. It’s attached to T5 so not the closest but the train to T3 is free and no hassle at all and as well as being the nicest hotel you’ve got the facilities of T5 basically on site as well. If we’re talking after Jan, the new Hilton Garden Inn at the terminal. Thanks Rob, first week of Jan, doesn,t look it’ll be open yet. If you don’t mind a taxi, that opens up all the other hotels in the further reaches of the M4, but avoid anything with T4 or T5 in its name. Don’t know what I was thinking – not enough coffee! Swap 3 with 4. 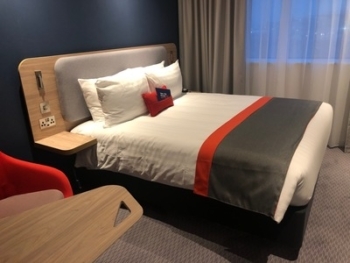 Hilton Garden Inn at Hatton Cross is also an option but tube doesn’t start until 6ish I think – although plenty of buses from the bus station outside Hatton Cross tube. Piccadilly line commenced just before 5 am, certainly on Mondays. Stayed at the Ramada Hounslow last Sunday night (not great but wanted to stop my points expiring). Caught a tube from Hounslow Central at 05.20 to T4 and that wasn’t the first to leave. Is Hilton GI in the free bus zone at Heathrow? If so that is my preferred option and use it frequently for the Bath Road properties. Stayed here twice. First time must have been shortly after it became an HIE, as most reviews referred to some other brand. Was a good deal as only 10 000 points, while cash prices were over £100. But we had had to wait for 40 mins or so for the Hoppa, then realised just how far it is from T5. A long wait after an evening flight from ARN. But it did seem OK.
Second time March this year. Delay to our incoming flight from MAD meant we missed our connection to NCL and had to stay in London. BA sent us (and many others) to Holiday Inn Express London – Heathrow T5. Everyone checking in seemed to have BA vouchers. Staff did not seem to give a toss. We had dinner vouchers too, but the food was dried out and only edible because I was really hungry. Hotel was, of course, quite correct in denying us any IHG recognition, but something would have been nice. Having been expecting (and paid for) the rather nice DT at NCL, this was a real let down. Bed seemed to be tiny and we had to get up far too early to trek back to LHR, check in bags again etc. etc. Breakfast typical HIE style – fills you up, but not particularly nice. Bus stop outside the hotel if you want to go into central Slough. Agreed – the HIX T5 is the worst hotel I’ve stayed at this year. The place was rammed and they omitted to tell me that the Italian restaurant is closed certain nights of the week (the website doesn’t mention this either), so the main restaurant looked like feeding time at Butlins. Eating from M&S at the petrol station across the road is fine for some, but not my thing. I also found that the staff couldn’t give a toss. Sums up this place. When I complained to IHG they simply responded ‘it’s a budget hotel, try somewhere else next time’. Looks like it’s been delayed. 14 Aug according to the website. Wondering if UK Staybridges including this one, will continue the tradition of a free wine event for guests on some weeknghts?